Healthy Living Day 7: Review & Set Your Plan for Week 2! This is Day 7 of the 14-Day Healthy Living Challenge where hundreds of participants around the world work together to improve on their diet and fitness in January 2015. The challenge is now over, but you can do the tasks in your own time. Visit the overview page for all tasks and posts. Hi everyone!! 😀 We’re now at the mid-point of our 14-Day Healthy Living Challenge. Let’s get started! 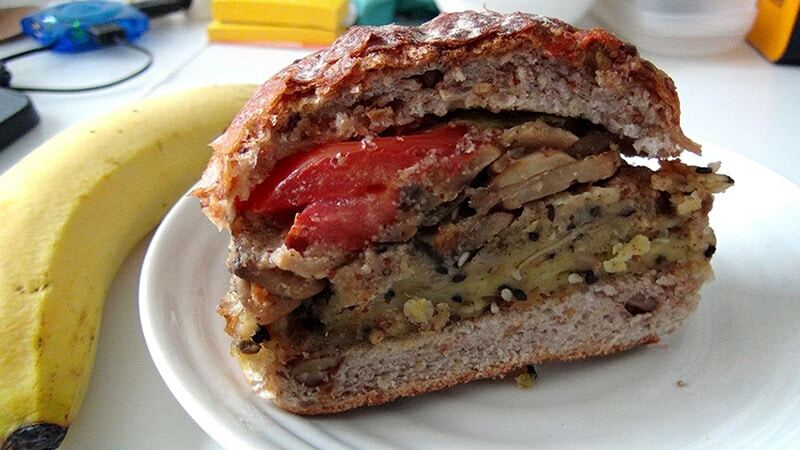 Brunch: Same grilled mushroom overload burger and banana that I had on Day 1, so I’m using the same photo. I’m someone who’s perfectly happy eating the same things all the time once I’ve found something that I like! 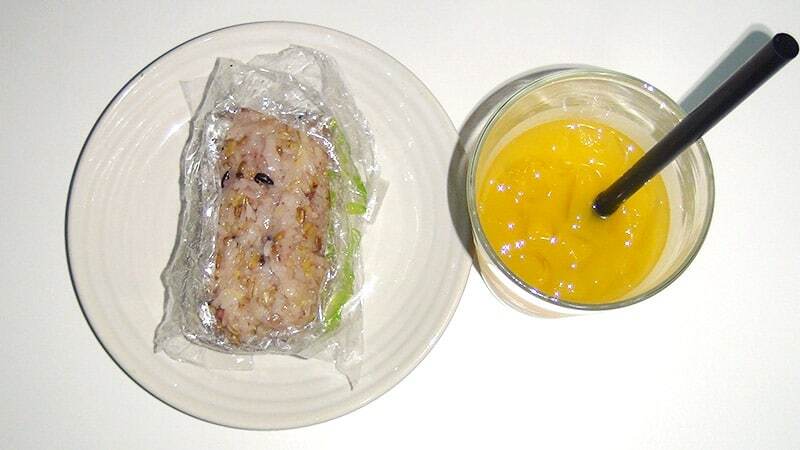 Dinner, same combi as my dinner on Day 4: QQRice and freshly squeezed orange juice! My QQRice ingredients this time are red rice with pickled vegetables, mushoom, vegetable floss, braised peanuts, and mock duck. Yum! My third exercise for the week! 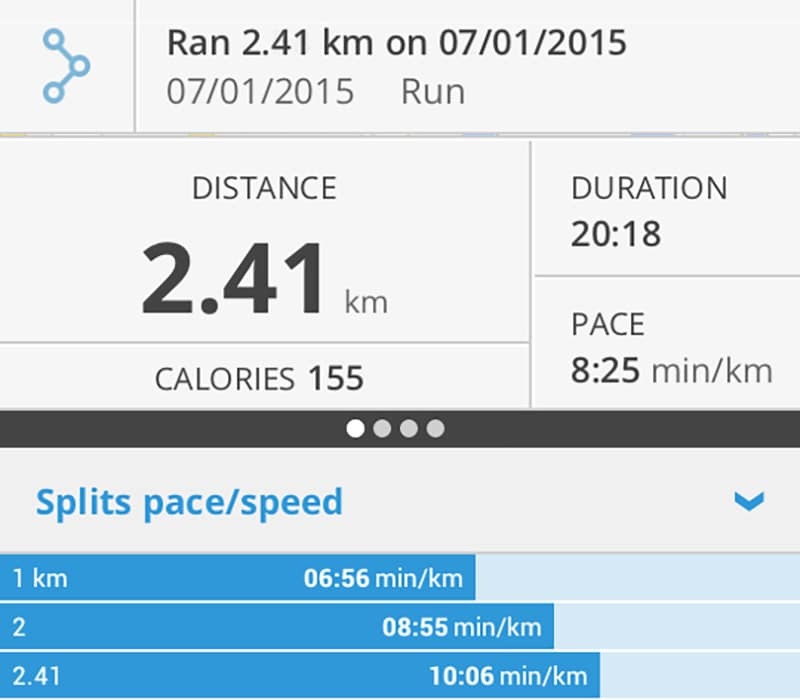 Nighttime jog of 2.41km at 8:25 min / km, burning 155 calories. 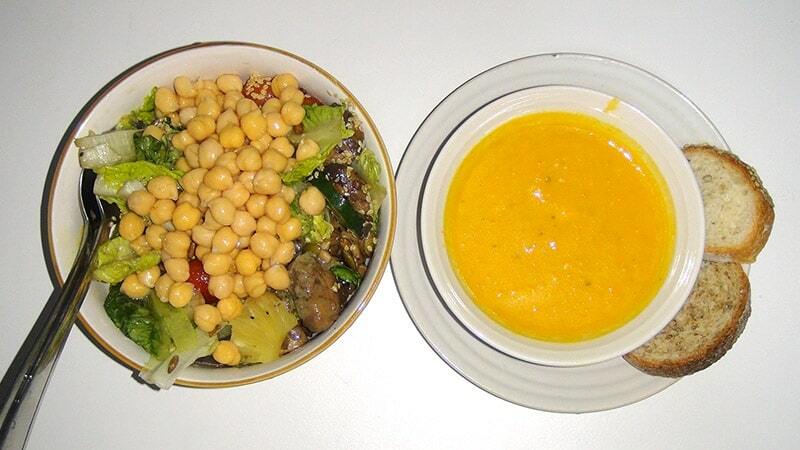 Supper: The second half of the salad I took away yesterday and an orange carrot soup with bread. I really like the salad; Ken had half of it and said it was great too! Salad ingredients, same as yesterday’s: Mushroom, chickpeas, pineapple, grapes, sunflower seeds, cucumber, and sesame seeds! I ended the day with a nice ginger tea (not in picture). Eat salads more regularly, ideally once a day if I can – Check, ate another salad today! Check out other participants’ amazing food logs and progress updates in Day 6’s comments section! Some of you may have been sticking to your plan to a tee. If so, that’s awesome — give yourself a HUGE pat on the back! 😀 Some of you may have fallen off track for some days, perhaps even since Day 1 of the challenge. If so, that’s okay. Everyone falls off track in their diets and exercises — even their life plans — all the time. It’s no big deal. Really. When you fall off track, the question isn’t so much of how far off you are from your target. The bigger question is what you do when you get off track. Do you beat yourself to a pulp and feel bad about what you’ve done (or not done)? Or do you acknowledge that things aren’t the way you want and work on them? The difference between these two actions is huge. The former drags you down a self-defeating hole. The latter helps you to move forward and create real change. Remember, this is our challenge, and we’re all in this together. You’re not doing this alone — all of us are working on living healthier, together, as one big family. Now that it’s Day 7 / end of Week 1, today’s task is to reflect on your progress in the past week and plan for Week 2 ahead! On a scale of 1-10, how do you feel about your diet and fitness in the past seven days? Why? What goals did you set for yourself at the beginning of the challenge? How have you been doing in them? Why? Have there been any obstacles preventing you from sticking to your healthy living plan? If yes, what are they? How can you overcome them? What are the biggest things you’ve learned this week, health and fitness related or otherwise? Have you completed the tasks for Days 1–6? If not, catch up on them today! Step 3: Set Your Healthy Living Plan for Week 2! What are your key goals for the next week? Review your 14-Day Healthy Living Plan and add on/revise your tasks/goals for Week 2 as needed. If your goals are the same, stick with what you’ve written. What are your key action steps to make Week 2 a bigger success than Week 1? How can you prepare for a great Week 2 ahead? Write the steps down, then act on them! 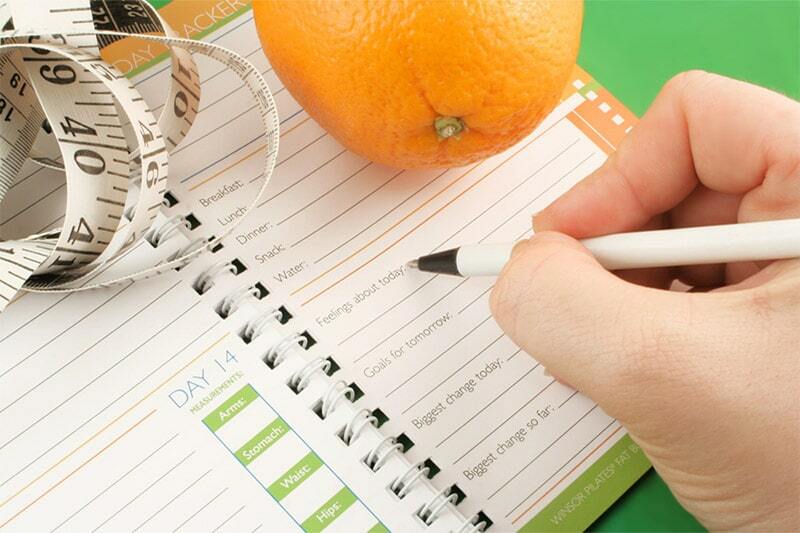 What tasks have you set for Day 7 of your 14-Day Healthy Living Plan? Do them today! After you’re done, proceed to Day 8: Get a Great Workout!